Ages: Adolescents and Adults. This instrument takes 10 minutes to administer and includes tasks that provide clinically relevant information about oral and verbal apraxia. 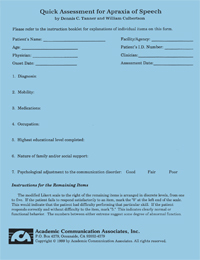 The instrument offers an organized, step-by-step method for quickly assessing the presence or absence of the motor speech programming disorders.